10 days ago KAA Gent announced it's seeking ideas for a farewell ceremony at the Ottenstadion. 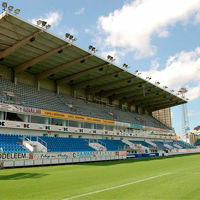 Next season the team moves to Arteveldestadion and their 93-year-old home needs to be left in a proper manner. Fans have sent dozens of suggestions via e-mail, but not all of them are viable at all. For example, KAA Gent is sure not to play any game on the day, because league schedule is very tight and players leave on holiday right afterwards. Thus, any suggestions of inviting Barcelona are a distant dream. Players will, however, finish their season in retro jerseys with “Jules Ottenstadion 1920-2013” overprint. Most likely the farewell party will resemble community days like the one in Solna recently, where fans came in thousands to collect souvenirs of their historical ground. Possibly fireworks display will also be held.